At that time, Birmingham was divided in black and white areas with the two regions rarely meeting. Yet, her parents worked hard to make their child an accomplished young woman. Rice started to take piano lessons when she was only 3 years old, and became a musical prodigy in the area performing at several local events. She also took French and Spanish lessons after school and worked hard to become a competitive figure skater. Rice was a good student from an early age and earned good grades, attending segregated schools in Birmingham. Her childhood memories include the horror that her city experienced during the emerging civil rights movement during the late 1950s. In 1965, at the age of 11, her family moved to Tuscaloosa, Alabama, and later settled in Denver, Colorado. She finished high school at the age of 15, and in the same year, completed her first year at the University of Denver. As she always dreamt of becoming a concert pianist, she took music as her major at the University of Denver. Later, however, she changed her major due to her newfound love of political science and Russian history. She began taking Russian-language and history courses captivated by the politics during the Cold War. In 1974, she graduated from the University of Denver and went for a master’s degree in government and international studies to the Notre Dame University, Indiana. Rice’s confidence in her abilities and her decisions came out with her way of dressing too. Favoring Giorgio Armani suits and Yves Saint Laurent lipstick, Rice is one tough cookie that controlled the world at her own terms. Rice worked for some time as an executive assistant but later returned to school to earn her Ph.D. degree from the University of Denver in 1981. With her strong dissertation, investigating the relations between Czechoslovak Communist Party and army, she became the first woman to have been offered a fellowship at Stanford University. She accepted the offer and the following year, she began teaching political science at the university. In 1987, Rice became the tenured professor at Stanford but also continued to work as an informal campaign adviser to Gary Hunt, a Colorado Democrat. Her acquaintances with a foreign policy expert, Brent Scowcroft, got her hired as a staff member in the National Security Council – her first government job. Eventually she became a special assistant to the first President Bush as an expert on Soviet and East European affairs that was an integral part of foreign policy. However, she got tired of it and resigned in 1991. She went back to teaching at Stanford and became the first-ever female provost of the university. Rice remained on friendly terms with the Bush family and came to know George W. Bush who later won the 2000 Republican Party’s nomination for presidential candidate. Governor of Texas at the time, Bush hired Rice to lead his team of foreign policy advisers. 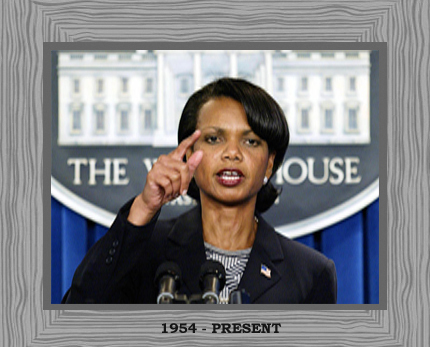 In November 2000, Bush won the elections and named Rice his national security adviser and she became the first African-American woman to work on this position. Condoleezza Rice, U.S national security advisor, reached her position as one of the most influential women in global politics due to her confidence and calm demeanor. With her nerves of steel and her poise and controlled attitude, she took many critical and controversial decisions while holding the office. After 9/11, Rice worked hard to shape the U.S foreign policy. It included waging war against Afghanistan for giving shelter to Osama Bin Laden, the leader of an Islamic fundamentalist who claimed responsibility for the 9/11 attack. Then in March 2003, US invaded Iraq on suspicions of having weapons of mass destruction. These were critical times for Rice as US troops were being targeted and attacked and Bin Laden was still to be captured. In April 2004, Rice was called to testify before a special commission that was investigating the 9/11 attacks and if they were a result of lapse of security and negligence. She held her ground when being questioned and was very firm and confident defending the president and the government. Even though she no longer holds the office today, yet she is held in great respect and admiration by the people who worked with her. She still lives in Washington and is close to the former president and his wife and loves watching football. Even though her name was circulating as a future vice-president, she believes that she is better suited as a commissioner of the National Football League and wants to become a full-time teacher as she misses her students a lot. Condoleezza Rice has been one of the most influential women in the world of politics after she became the national security advisor to President George W. Bush. Highlights of her work include shaping the U.S foreign policy as well as launching wars against terrorism in Afghanistan and Iraq. Famous Black People - Content & Imagery © 2014.